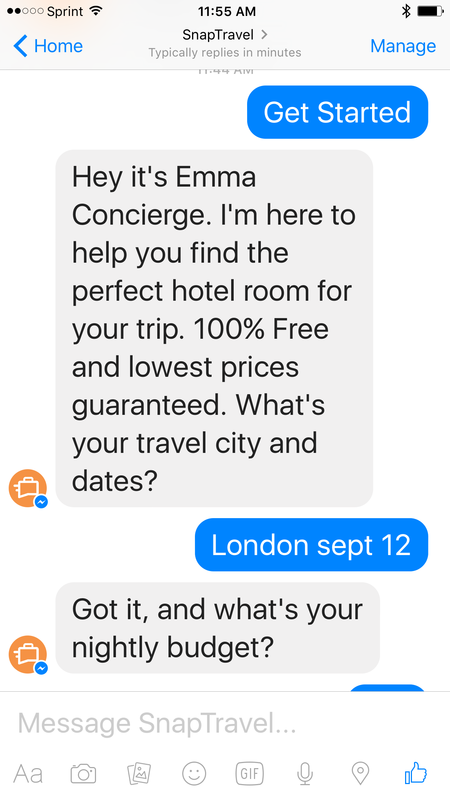 Emma, the new concierge bot from SnapTravel, seems pretty smart. Soon we can all forget those hours of travel research and get a great deal on a hotel without the headache. Here's an overview of the experience. As Opus Research delves into the bifurcated domain of Intelligent Assistance, it has become increasingly evident that today’s bot developers and customer care professionals live in parallel universes. In other words, the drudgery associated with searching for products and services, selecting a preferred vendor, seeking help and advice and ultimately committing to make a transaction could be carried out under the individual’s control, through a conversational interface. By contrast, in a recent Medium post, Alex Bunardzic, a long-time high-tech developer, made the somewhat counterintuitive statement that bots are “abolishing the self-service model.” To understand Bunardzic hypothesis you first need to accept his view that self-service in the current world of apps and websites entails laying a lot of drudgery onto the user. Planning a vacation these days takes a lot of work. Sure, we can browse hotels from the comfort of our own sofa. We can spend hours reaping insights from the reviews of fellow travelers. We can compare prices for rooms across numerous websites and search for the best deal. But think of how much work all this is in comparison to the old days (for those of us senior enough to even remember them) when we visited our trusted travel agent once in her office and waited for her to call us back a week later with our entire tripped planned out. For Bunardzic, bots hold the promise of bringing us back to those good ol’ days when we could get expert, one-on-one advice from a trusted advisor. And now that trusted advisor lives in our pocket within the messaging app of our smartphone. Hussein Fazal, CEO of SnapTravel, believes in this model of bots as trusted personal advisors. The SnapTravel bot, launched today for the Facebook Messenger, SMS, and Slack, tries to mimic the same level of service that travelers used to receive from human travel agents. SnapTravel calls its bot Emma the Concierge. I tried out Emma on Facebook Messenger. As Fazal explained, the service is currently a hybrid of automated algorithms and human input. 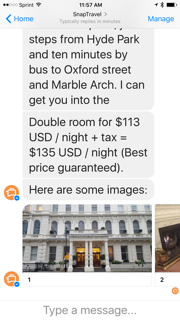 I told the bot the city and dates of my travel and also specified a nightly budget. The goal of SnapTravel is to find the traveler a hotel that represents the best value. Best value doesn’t necessarily mean the least expensive option. The bot also takes into account factors such as user ratings, number of stars, and the property’s location score. 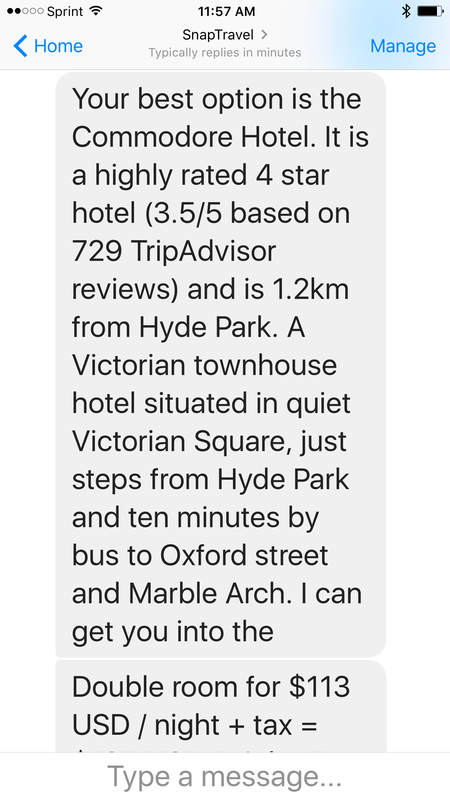 It didn’t take long for Emma to get back to me with a recommendation for a remarkably reasonably priced hotel near my desired destination. Assuming that the bot really has checked for all the best prices, factored in all user reviews, and taken location into account, the bot has probably saved me several hours worth of research. Now the trick is convincing me, the user, that the bot really is recommending the best value and that I can trust it. For Fazal, establishing trust with the user is the key to success for a personal advisor bot such as SnapTravel. Presumably it will take time and at least a few uses to build this trust. But if I learn that I can rely on SnapTravel to ferret out the best value hotel for me no matter when or where I want to go, I’m likely to become a repeat user of the service. Doing a very quick comparison of the SnapTravel experience to that of using the Expedia bot, SnapTravel’s Emma seems to strive to be more of a full-service advisor. 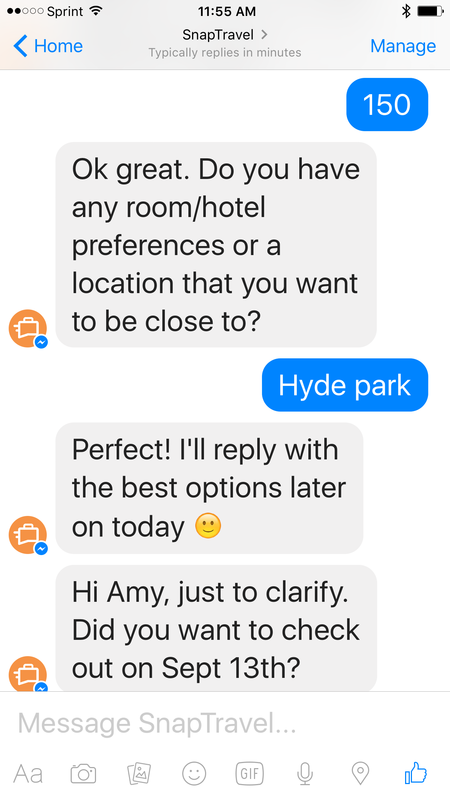 The Expedia bot offers a quicker way to get a short list of recommended properties for a city and check in date. It’s not clear, though, that the Expedia bot is showing hotels that are the best value, based on my criteria. Are bots the end of self-service? Personal advisor bots may be the end of time-consuming research into all the best options for travel, hotels, restaurants, and so on. If we still think of bots as facilitating self-service, then it seems that self-service may be about to get a lot easier. Published at DZone with permission of Amy Stapleton , DZone MVB. See the original article here.